Why should investors lower their expectation from market in 2018? In 2017, Mid-cap and Small-cap stocks outshined the Large-cap stocks. BSE Mid-cap and BSE Small-cap gave magnificent ~48% and ~60% returns in 2017 respectively. Indian equity market gave splendid returns in 2017 after two lackluster years. 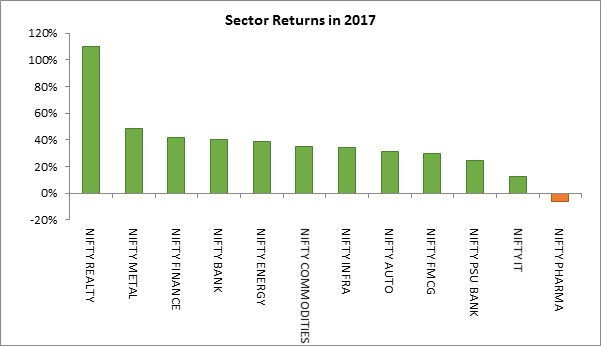 Nifty 50 gave 28.6% return in 2017 compared to mere ~3% in 2016 and a negative return of ~4% in 2015. In 2017, Mid-cap and Small-cap stocks outshined the Large-cap stocks. BSE Mid-cap and BSE Small-cap gave magnificent ~48% and ~60% returns in 2017 respectively. In sectors, Reality and Metal outperformed the other sectors. Nifty Realty and Nifty Metal gave a magnificent return of ~110% and ~48% in 2017 respectively. Government’s emphasis on ‘Housing for All by 2022’, RERA and infrastructure status to reality sector provided the required revival to the reality sector, whereas, recovery in the commodity prices supported the metal sector. IT and Pharma sectors underperformed in 2017. The pricing pressure and Visa norms in the US put weight on IT companies, while, slow approvals by USFDA and pricing pressure kept the Indian pharma companies underneath. In 2017, Moody’s upgraded India’s Sovereign rating to Baa2 from Baa3, after a long haul of 13 years on the back of significant reforms and structural changes. 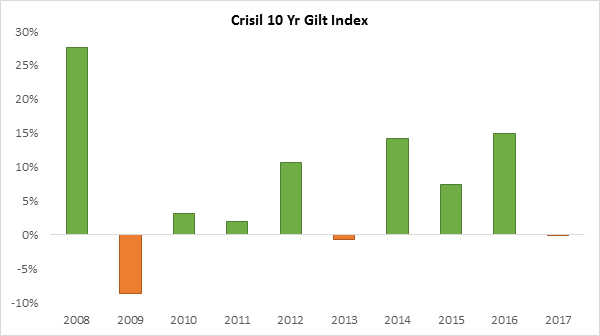 However, bond investors faced disappointment in 2017, as 10-year government bond yields rose fearing a rise in inflation and fiscal slippage. In 2017, G-Sec gave a negative return of 0.1% vis-à-vis 15% in 2016. 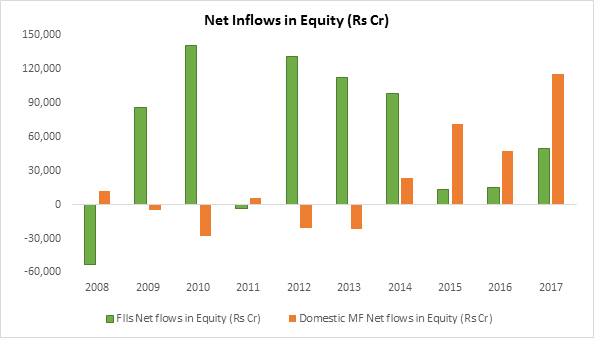 In 2017, domestic MF’s net inflow in equity was highest in the decade. They poured ~Rs1.15 lakh cr in equity in 2017 against ~Rs47,544cr in 2016. The inflows from domestic MF industry is expected to continue on the back of strong investments in mutual funds. FII net inflows in the equity market in 2017 also surpassed inflows in previous two years. FII net inflows in equity market stood at ~Rs49,000cr in 2017 compared to ~Rs15,102cr in 2016 and ~Rs13,056cr in 2015. Economic growth to accelerate: Economic growth was subdued in 2017 due to the shock of demonetization and GST transition. However, in 2018, the economy is expected to recover, which has already been factored in the market. Earnings growth to improve, but already factored in: Recovery in economic growth and commodity prices are favourable tailwinds for corporate earnings growth. 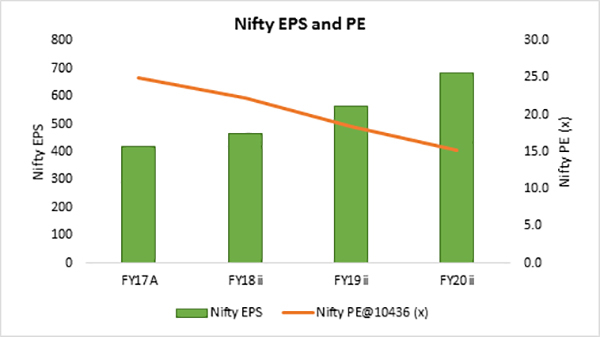 In FY19, the corporate earnings will grow in mid-teens after many years of single-digit growth. However, the markets have already factored in the recovery in the earnings in the valuations. Inflation to rise, but within comfort zone: In the last couple of years, inflation had fallen significantly supported by the sharp decline in crude oil prices, fall in food inflation due to two good monsoons and efficient food management by the government. In 2017, the CPI inflation dropped to 1.2% in June 2017 from 11.5% in November 2013. However, in the second half of the year, inflation rose continuously owing to rising commodity prices. Many investors are expecting similar returns of 2017 in 2018 from the equity market. However, the market has already factored in most of the positive triggers. Moreover, rising CAD and inflation accompanied by deviation from fiscal consolidation path can put weight on the market sentiment. 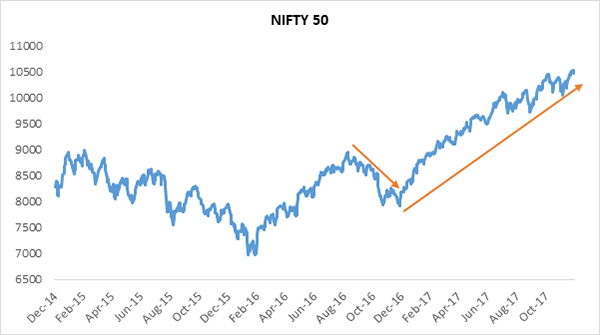 Besides, Nifty corrected from 8,900 in September 2016 to 7,900 in December 2016, a correction of ~11%. Therefore, owing to the lower base in December 2016 and one-side rally in the market, without any meaningful correction, had given splendid returns in 2017, as the market was near all-time high in December 2017. Thus, 2018 will be a challenging year for investors and they should lower their return expectations in 2018.